Summary: When Loki attacks the earth and steals the Tesseract, a dangerous energy source, the Avengers must assemble and work together to defeat him. Genre: A superhero action movie, with a dash of comedy. Gore: Not a lot of gore, more sci-fi deaths. One scene involves a man getting his eyeball stabbed by a sci-fi laser-drill, but this is done partially off screen. Character List: Captain America (Chris Evans), Steve Rodgers, is the leader of the Avengers. 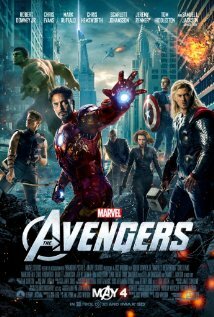 Ironman (Robert Downey Jr.), Tony Stark, is the uncooperative billionaire. The Hulk (Mark Ruffalo), Bruce Batter, is the mild mannered scientist who can change into a huge green monster fueled by rage. Thor (Chris Hems worth) is the demi-god from Asgard and Loki’s brother. Black Widow (Scarlett Johansson), Natasha Romanoff, is the amazing spy and agent of S.H.I.E.L.D. Hawkeye (Jeremy Renner), Clint Barton, is the amazing archer and agent of S.H.I.E.D. who is turned evil by Loki. Loki (Tom Hiddleston) is the upset younger brother of Thor, who wants to steal the Tesseract and take over Earth. Phil Coulson (Clark Gregg) is an agent for S.H.I.E.L.D. who helps bring the Avengers together. Nick Fury (Samuel L. Jackson) is the leader of S.H.I.E.L.D. who manages the Avengers. Maria Hill (Cobie Smulders) is an agent for S.H.I.E.L.D. who is Nick Fury’s assistant. Pepper Potts (Gwyneth Paltrow) is Tony Stark’s wife. Selvig (Stellan Skarsgard) is a scientist who works with the Tesseract and is turned evil by Loki. Plot: When Loki steals the Tesseract from S.H.I.E.L.D. and turns Hawkeye and Selvig evil, Nick Fury must find a solution to save the world. Black Widow and Agent Coulson help get Hulk, Ironman, and Captain America together on Nick Fury’s gigantic plane. Hulk is only brought on for his genius and familiarity with Gamma Rays. Meanwhile, Hawkeye, Loki and Selvig are starting an underground Tesseract lab and assembling the parts needed to bring Loki’s army to Earth. When Loki is captured, Thor arrives he takes Loki and, Captain America and Ironman have to fight to get him back. They finally get Loki locked up on the plane, but he seems happy. In the planes lab, where Ironman and hulk are working, all of the Avengers are fighting one another. Loki’s staff in the lab is helping the Avengers find the Tesseract. Loki gets Hulk to attack the plane and all of the Avengers to split up. They reunite in New York, after Hawkeye turns good again. Loki unleashes his army and the Avengers finally work together. They do their best, but can’t close the portal releasing the army. The government sends a nuke into New York, but Ironman intercepts the missile and sends it into the portal just as Black Widow closes it, destroying that army forever. All the Avengers go their separate ways and ready to assemble in the future.